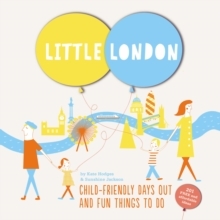 Little London is full of fun and fascinating things to do with little adventurers in the big city. Get out and about and inspire your children's imaginations! Full of the capital's best-kept secrets, just waiting to be discovered, Little London contains over two hundred things to do all year round, all over the city, and best of all, most of them are free. Bursting with activities, day trips and a few games, recipes and craft makes, there's lots of ideas to keep tiny toddlers and older boys and girls entertained, and plenty for the big kids to enjoy too! With so much to do and so much to see, Little London's handpicked activities are combined with handy tips and all the essential information you need to make planning family days out fun and fuss-free. Turn the city into your secret playground with Little London!